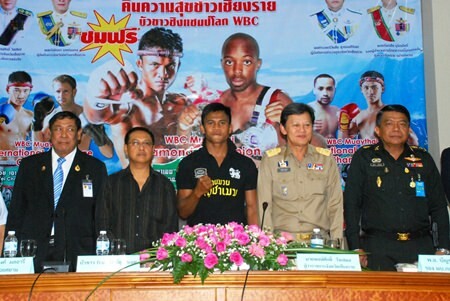 Buakaw Banchamek is joined by Chiang Rai Governor Pongsak Wangsamer, Col. Bancha Duriyapunt, Deputy Military District Commanding Officer of Chiang Rai; Somkiat Kanchanasirikul, WBC Executive Director; and Patompong Polaree, Muay Siam team at the press conference to announce the upcoming bout. Surin native Buakaw Banchamek is ready for his welterweight Muay Thai WBC World Chamionship match scheduled for August 15, 2014 against Abdul Turay from France. Buakaw, born Sombat Banchamek, started boxing at the age of 8 and won the featherweight title in 2004 followed by a lightweight title and the K-1World Max title, the first man to win it twice. He has 216 wins, 21 losses and 12 draws, 56 of those wins by knockout. He retired from boxing for several years after years of dispute with his original gym and returned to professional boxing full time in 2012. Chiang Rai Governor Pongsak Wangsamer, Col. Bancha Duriyapunt, Deputy Military District Commanding Officer of Chiang Rai; Somkiat Kanchanasirikul, WBC Executive Director; Patompong Polaree, Muay Siam team and Buakaw Sombat Banchamek joined together at the press conference to announce the bout. The fight will be held on August 15, 2014 at Chiang Rai Rajabhat University and will include other World Muay Thai matches. 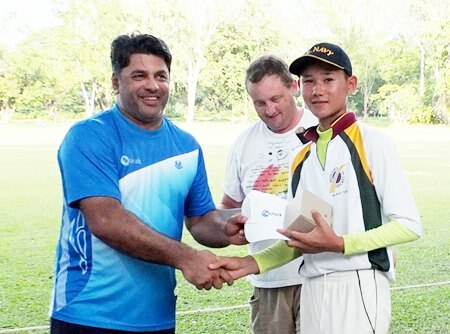 Chanchai played well in the last games of the cricket season and is a bright light for next season’s cricket. Although high temperatures and the inevitable heavy rain have eventually brought the local cricket season to an end, it was not before the cricketers of Chiang Mai had entertained a series of touring teams as visitors from across South East Asia enjoyed great hospitality and some highly entertaining cricket. Chiang Mai’s junior hill tribe cricketers gained more valuable experience against quality opposition and the locals joined together to show that cricket played in coming seasons would be both competitive and friendly. The Sri Lankan Navy Sports Club was the first visiting team who had a very strong side on show as the team plays in Sri Lankan first-class cricket. The first match was a 40-over contest against a Chiang Mai Select XI at Prem Oval. The visitors were asked to bat first as the locals felt they were stronger in bowling than in batting. Samran and Paul Johnson provided a pacey opening attack and they were well backed up by Walter Persaud and Mohammad Makki. The innings completely changed in character after Buddhika hit four consecutive sixes from the bowling of Basharat Wani and the Sri Lankans were able to accelerate to an impressive total of 300 for 6 in their 40 overs as Buddhika reached 69 and captain Suranga Paranavitana finished on 70*. Chiang Mai started well against the new ball as Naveed made 24, but the middle and lower order struggled against the turning ball as Sujith and Suranga both took three wickets. Few runs were recorded in the score book but at least the local batsmen spent some time at the crease before being dismissed. The Chiang Mai side was bowled out for 115 as the locals were soundly defeated by 185 runs. The two teams moved on to Royal Chiang Mai for a T20 match the next day but although the home side made a good start thanks to Naveed’s 30, they were dismissed for just 75 as Hasaranga took 3 for 11 and the Sri Lankans scored 78 for 3 in 9.4 overs to race to a seven-wicket victory. Chanchai and Cher bowled well with the new ball with Chanchai picking up two wickets. The Sri Lankan Navy’s tour was a great success thanks to the efforts of Thailand umpire Upul Kaluhetti and it is hoped that further visits will follow and that the Thai youngsters can make regular tours to Sri Lanka in the future. Lamma are one of the most colourful teams to play in Hong Kong cricket and they proved to be much more Lanna’s standard as cricketers. Chris Coombes has played for both clubs and he was delighted to bring the two sides together for some fantastically enjoyable social cricket. Torrential overnight rain had put the first fixture in doubt but the hard work of Prem’s ground staff meant that a twenty over match was able to be played late on the Saturday afternoon. Lamma batted steadily to reach 100 for 9 in their 20 overs as Choo took 3 for 23 and Chanchai 2 for 12. Lanna reached their target with three overs to spare to record victory by three wickets, with Chris Coombes making 23 and Gary Chatfield 22. It is notable that in a weekend of cricket between Lanna and Lamma, the home side had as many as eight players with names beginning with C.
Lanna’s victory was celebrated with the club’s inaugural barbecue and plenty of beers were consumed in a very convivial atmosphere. Money was raised to help support the Lanna Juniors team and the evening’s entertainment may have contributed to the events of Sunday afternoon at Gymkhana Club when the visitors were reduced to a pitiful 14 for 8. Lanna’s opening attacking wasn’t speedy but it was accurate as Jon Danby and Adam Green combined to bowl 14 dot balls and take the first three wickets. The scoring rate clearly needed to increase so Tom Salusbury was introduced but his tempting lobs only resulted in four batsmen being dismissed for ducks. He did concede a solitary boundary but quickly got back on track as he claimed his fifth wicket for six runs in two overs. Remarkable figures for a veteran bowler who was soon to become the new chairman of Lanna CC with big plans for the club but he will be unlikely to be able to repeat those figures which are the best so far recorded for the club. He also raised over 10 000 baht for junior cricket and the Hill Tribe fund to celebrate his birthday, so he clearly richly deserved this historic moment. Lamma did recover to reach 77 as Simon Joyce made 31* but Lanna finished the match off in style as Bunchuai made 37* and Tim Jones 22* to claim victory by nine wickets. It had proved to be a wonderful weekend of friendship on and off the field and it is hoped that the players and supporters of Lamma CC will be returning soon. Chiang Mai’s season finally concluded with the visit of Ctrack CC from Malaysia who embarked on an ambitious programme of four matches in three days but the visitors were more than a match for the locals as they won all four matches. Ctrack’s tour began with a 35-over match against United CC, a new team put together thanks to the enthusiastic efforts of Burhan. Martin Cardno made 40 and Bunchuai 37 in a total of 187 for 9 and Ctrack had to work hard to secure victory by three wickets with just an over to spare as Mansur saw his side home with an unbeaten 54. Next day Ctrack’s batsmen were much more impressive as they scored 327 for 5 in 40 overs against Lanna with Dilawar making 79 and Ehtesham a remarkable 77* in just 22 balls. Chanchai escaped too much punishment and claimed two wickets. Lanna were soon 31 for 5 but recovered to reach a total of 135 as Jason Bray made a determined 42 and Cher and Chanchai both defended well. Ctrack had shown the difference in class between the two teams as they recorded a crushing win by 192 runs. Sunday saw two separate twenty-over matches at Gymkhana Club with Ctrack defeating United CC by 72 runs in the morning as Javed scored 69* in a total of 175 for 3, but Lanna almost pulled off a surprise victory in the afternoon. Ctrack were restricted to 150 for 9 as Chanchai again impressed with the ball as he snared four wickets. Cher and Richard Cowles shared an opening stand of 52 and Martin Cardno hit a quickfire 44 but Lanna finished just eight runs short. Ctrack had completed a perfect 4-0 record but the Malaysian team had enjoyed their tour and the locals had taken part in a very busy month of cricket and several people should be thanked for their great efforts including David Holt, Nick Hanlon and Richard Cowles. The magical month of May had shown just what was possible in future seasons for the cricketers of Chiang Mai if they work together for the common good.